With over 18 years of kiteboarding experience and 14 years teaching experience, Andrew and Luke will teach you the right way. Safely, quickly and with the most fun imaginable. The 1 hour teaser is a great way to get a feel for it. This is the ultimate introductory lesson to find out if kiteboarding is for you. Our group lesson is for a minumum of 2 people. So if you have friends or family members that you want to learn to kite with, this is perfect. The 1 hour advanced is perfect if you are already riding and want to bring your kiting to the next level. Wanting to learn kite foiling, but just not too sure where to start? We have come up with a program using the latest user friendly equipment. We also offer lesson packages if you decide to bite the bullet and sign up for a full course. See below! The 4 Hour Private Kiteboarding Course is perfect if you are serious about becoming an independent kitesurfer. We take you through everything you need to know. Our 4 hour course is based over 2 X 2 hour lessons. This is a great introduction to kiteboarding and will give you good skills and knowledge. You will progress and achieve defined goals needed to help you become an independant kiteboarder. We have discovered that the most effective way to teach students is one on one. Grab your lesson voucher here and learn with professional and passionate kitesurfing instructors. 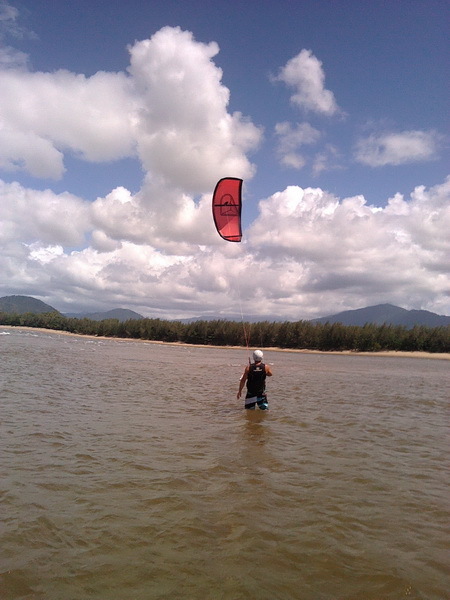 Come and learn to kiteboard with us at kiteboarding Cairns. Experience shows that a 2 hour lesson is the most effective time to learn in one session. Our full course is for a minimum of 2 people. ($440 per person). So if you have friends or family members that you want to learn to kite with, this could be a great option for you! This is a more affordable option for some people. Our full group courses are located in the flat waters of Yorkeys Knob lagoon, at the southern end of Yorkeys Knob. ve you a great introduction to kitesurfing and will take you through half of the course. Generally, we say 3 lessons. That’s 6 hours of premium one on one tuition. Each lesson will progress you, giving you more confidence and skills as we go. Need to Know More About Our Lesson Structure? The first lesson is all about kite control and a lot of safety. So, you can happily learn what you need to know in a lighter wind. However, there is a lot more action in the second and third lessons, so You will need a decent breeze. We always teach in the right conditions. Your progress is the most important thing for us. At Kiteboarding Cairns, we really want to see you Kitesurfing. It’s Our Passion. Not just a job. When you learn at KBC you’re not just another lesson. You are important to us. Even once you have completed our two day course, we will continue to look out for you on the water at our magic location– Palm Cove. Kitesurfing in Australia is great in the winter months if you kite at Palm Cove in tropical Cairns. Our Motto – Safety, Fun, Excitement, Freedom, Community Friendship. Our students gain a working knowledge of all aspects of safety involved in this powerful sport. We adhere strictly to International Kiteboarding Organisation – IKO standards. As Our student, you will receive a qualification to prove that you have this safety knowledge. All training is in line with IKO standards. Kitesurfing in Australia during the winter months happens at our tropical paradise. Cairns.